Between Blue River and Warriors Mark (which is within the town of Breckenridge) is a neighborhood of very large homesites that back up against the national forest. Gold King Placer (unSub) is it's official name - UnSub and why? Because it belongs to no town, just unincorporated Summit County. This is just like someone who lives in Breckenridge or anywhere around it, to be ruggedly individual, and yet you catch them in any other part of the world and ask where they call home, and they'll say "Breckenridge". 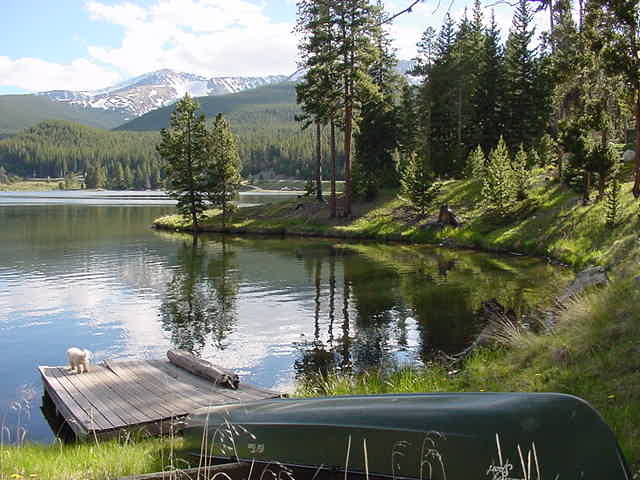 Gold King Placer is a neighborhood between the town of Breckenridge and the small incorporated town of Blue River. The lots are big, there is a paved road through the middle of it that no one but its residents, or neighbors know. It's snow covered all winter and snowshow and ski trails are just out the door. Head west of Gold King Placer and you'll hit the Burro Trails that comes from Beaver Run toward the Peak 10 side of the Breckenridge Ski Resort. Ingenious folks staying here will find a way to the ski lifts, but there will be no signs indicating how to get there -- but it is just over the hill. Creek, beaver ponds, lots of forest are all within sight of any Gold King Placer property for sale. Spruce Creek Road is the gateway to great trails to popular destinations like Mohawk Lakes, and Gold King Placer is located just off this county road, too. Take the U.S. Forest Service Road that Spruce Creek or Crown Drive funnel into, and you'll arrive at the Spruce Creek trailhead, about a mile up that trail it connects to the Burro Trail which leads back to the base of Peak 9. Further up the trail, you'll cross the Wheeler Trail that extends from Hoosier Pass to Copper Mountain, and there you can see stunning Continental Falls that flow from the lakes situated in high meadows at the foot of the Tenmile Range. Square Footage: 360 to 5,812 sq. ft.
Drive south through Breckenridge to the last stoplight at Boreas Pass Road and turn west, onto Broken Lance Drive, continue on this until you see the road rise and notice the name has changed to White Cloud Drive. Travel through Warriors Mark West on this road and keep going until you find your designation in Gold King Placer - is just past the town limits. Drive south on Highway 9, and take a left on Crown Drive, about 1/10th of mile from the last stoplight in Breckenridge, at Boreas Pass Road. This road continues uphill through the Crown and connects to Spruce Creek Road, which you can also turn onto from Highway 9 and arrive at this same junction. Just pass this junction, you'll find the first right turn is Lakeview Drive. Turn here and head back toward the town of Breckenridge and you'll eventually get to Gold King Placer. Of course, the first way is easier if coming from town.